This a ledgetop checkout counter with slatwall panel. 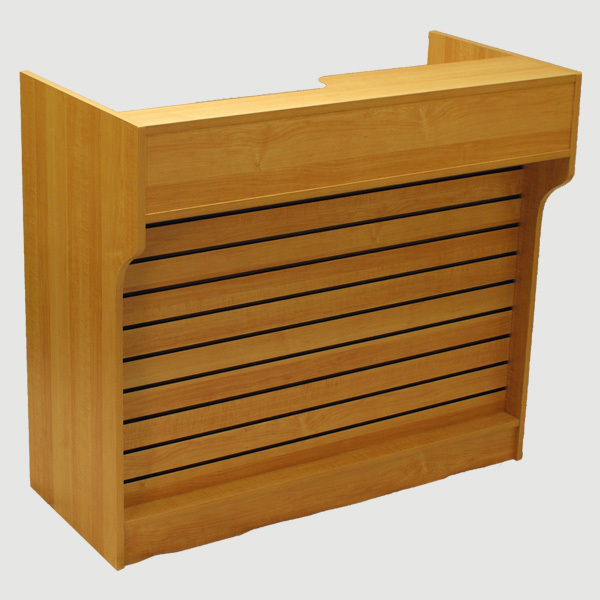 This ledgetop counter is an optimal design for placing products conveniently at the point of checkout for your customers. Increase you sales by making sure your products are placed in the most optimal areas of your retail space with this ledgetop checkout counter. Available in multiple finishes to blend in with your pre-existing décor easily. There are two adjustable storage shelves on the backside of this counter. This is perfect for storing important information or items within reach. There is also a 9” wide check writing table built into the ledgetop. The laminate surface is highly durable and will last in any fast paced retail environment. This ledgetop checkout counter gives you maximum functionality due to its slatwall front panel and the storage areas that are built in. Save floor space by adding this checkout counter to your retail space.